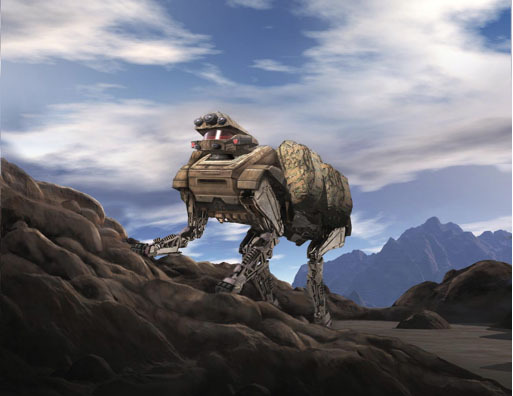 The legged robot, called the LS3, will be designed to lighten warfighters’ load by carrying over 400 lbs of gear and enough fuel for missions covering 20 miles and lasting 24 hours. Development of LS3 will take 30 months at a cost of $32M, with first walk out scheduled for 2012. Learn more about BigDog, PETMAN, the LS3 program, and the Waltham-based company, Boston Dynamics. Some of the 3-D animation used to recreate battles in Broadside. Click to view trailers. In the 17th century, New York was known as New Amsterdam and a rivalry existed between the British and Dutch that spanned oceans, continents, and empires and resulted in the fiercest naval war in the age of sail. Two hundred battleships, in miles-long formations, fought to determine who would dominate world trade for the next 200 years. Broadside, a documentary written, directed, and produced by Bruce Twickler ’67, SM ’68, captures this drama using period houses, galleries, gardens, and forts as the backdrop and through carefully researched recreations rendered in sophisticated computer graphic simulations. The two-hour film will air on public television nationwide beginning in October. But you can be among the first to view it at this premiere event sponsored by the MIT Club of Boston. Time: Screening begins at 7:00 p.m. Cost: $10 for MIT Club members and $15 for non-members; price includes refreshments and pre-screening gathering with Twickler, starting at 6:30 p.m. A Q&A will follow the movie at 9:00 p.m.
Register today with the MIT Club of Boston. Twickler is president of his own Cambridge-based production company, Docema, which previously released the documentary Damrell’s Fire, about how Fire Chief John Damrell stopped America’s cities from burning down. Watch trailers and learn about the history of the British-Dutch conflict, ship construction, and more on the film’s Web site. Boston Dynamics, the MIT spinoff now famous for its quadruped robots, is working on a new urban-surveillance robot that is capable of launching itself more than 25 feet in the air. The Precision Urban Hopper is semi-autonomous and about the size of a shoe box. It typically relies on four wheels to get around, but a piston-actuated leg that has been likened to an explosive pogo stick allows it to hop over obstacles 40-60 times its own height. Researchers at Sandia National Laboratories in New Mexico originally designed the hopper, which is being funded through the military’s research wing, DARPA. Waltham-based Boston Dynamics was recently awarded the contract for producing the next generation of robots. Delivery is planned for late 2010. Is the Current Strategy in Afghanistan Working? An assistant professor, an energy adviser, a UN worker, and an Air Force commander. These are a few of the MIT alumni who live and work in Afghanistan, where the United States has carried out military operations offshore since the 1990s, and on the ground since 2001. The stated aim of the military’s current mission, Operation Enduring Freedom, is to protect local Afghans, reduce violence, and cut off funding to the Taliban and other insurgents. How is it going? Several days ago General Stanley McChrystal, America’s top commander in Afghanistan, submitted a strategic review to General David Petraeus, NATO, and President Obama. While the full text of the report isn’t yet available, the take home message (according to reporters) is unambiguous: McChrystal thinks the current strategy in Afghanistan is not working. Newspaper columns and io shows have been covering the news over the last few days, and one in particular caught our eye. The Takeaway, a co-production of WNYC radio and Public Radio International, interviewed Fotini Christia. She is an assistant professor of political science at the Institute and recently returned from Afghanistan. Listen to what she has to say about the potential efficacy of a political, rather than, military surge in Afghanistan. Read more coverage of the report and Obama’s reaction to it, or watch a short Reuters video clip about the possibility of a new course in Afghanistan. When Missy Cummings, assistant professor of aeronautics and astronautics, and her students at MIT’s Humans and Automation Lab—HAL for short—discussed designing a new robot controller to streamline the interaction between humans and computers, the ever-practical MIT students suggested an iPhone app, because, well, they could all score free iPhones. Six weeks later, Cummings and a team of 30 debuted the app in a test flight to control an airborne drone via the iPhone’s accelerometer. Watch the flight below. The app sends GPS coordinates to the robot—commercially available, I might add—which it uses to navigate. All the user has to do is tap new waypoints onto the map display. The robot, or micro aerial vehicle (MAV), also contains a collision avoidance system and can stream video or photos back to the iPhone. One application for what’s dubbed MAV-VUE (visualization of unexplored environments) is a lightweight way for soldiers to control unmanned aerial vehicles. Professor Cummings has another idea for how civilians could benefit. Find out what it is in this Wired article. General Petraeus congratulates his son, Stephen '09, at the ROTC commissioning ceremony, as President Susan Hockfield applauds. Photo: Darren McCollester. 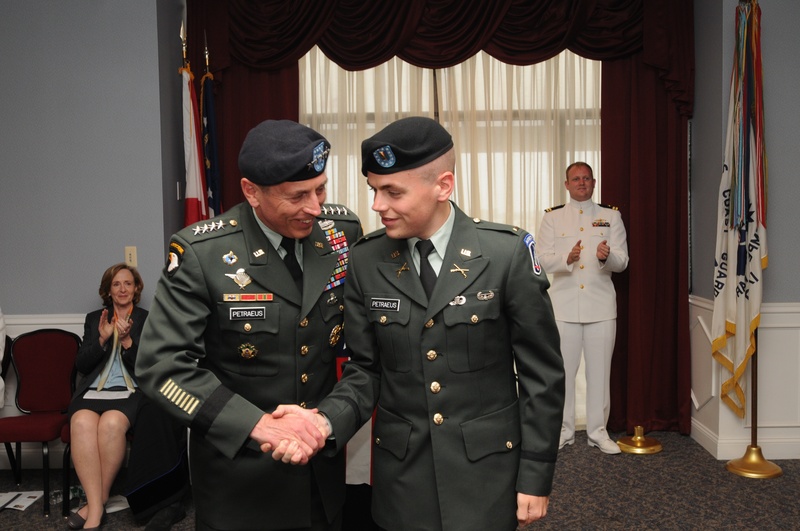 At MIT’s ROTC commissioning June 5, General David Petraeus was beaming like a proud father. And he was. As he presided over the commissioning of 12 members of the Class of 2009, he included in that oath his son, Stephen. The new graduate, a political science major, appears to be following his dad’s footsteps not only into the army, but into a larger understanding of world issues. The senior Petraeus holds a PhD in international relations from Princeton. This commissioning event also kicked off a new affinity group, the MIT Military Alumni/ae Association. The MITMAA aims to engage alumni with military experience or interests. Is that you? Learn more about the MITMAA online.